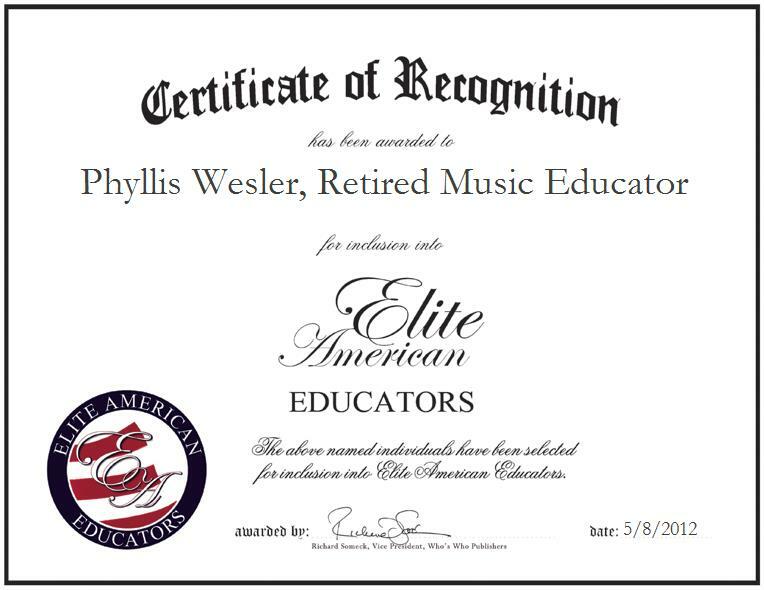 Phyllis A. Wesler is a Retired Music Teacher who formerly served Jefferson High School, a subsidiary of Centerville-Abington Community Schools. The award-winning educator has garnered a reputation of distinction for her outstanding efforts, and she continues to strive for excellence in her every endeavor. Prior to her retirement, Ms. Wesler helped students to learn about music and provided them with a quality education by teaching them the skills they need to succeed as music enthusiasts. She received accolades which have included the title of Star Educator I by Centerville High School in 1989, and the 2009 Outstanding Senior Citizens Award from Preble County, Ohio. Ms. Wesler is the former president of a number of organizations, which include the County of Wayne, the Kappa Chapter of Delta Kappa Gamma, and the Richmond, Indiana Branch of AAUW. She is the former director of Area Six of the Teachers Association, and she is a member of the Indiana Retired Teachers Association and Sigma Alpha Iota. Her students had the honor of performing at a Cincinnati Reds baseball game. She has accumulated an extra 30 hours from Indiana University, Ball State University and Earlham College.